For one teacher, edtech included a Roomba. It turns out the disc-shaped vacuum cleaner, which uses sensors to autonomously zip around homes is also a great tool to teach students about robotics and empathy. Yung’s students learned all about how the Roomba moves, behaves and how it works. Then they set off to dream up and draw their own robots that could help people in the real world like a robot that gives you a blanket when you sleep. Ok, I can see building a lesson around understanding how a robotic vacuum works. But does that make the device educational technology? Let’s face it, “edtech” is a very broad term and a wide variety of hardware, software and services have been tossed into that basket. So maybe we need to be a little more specific. I don’t expect this to catch on, but I see at least two subcategories: teaching technology and learning technology. That robot is learning technology only if kids are the ones using it. They should be playing with it, experimenting, programming it. Maybe even taking the device apart and changing it’s function, like the picture above. Technology under the control and direction of adults is teaching technology. Stuff like Google Classroom, FlipGrid, interactive whiteboards, most of the hot new stuff in your Twitter feed. And that’s not a bad thing. Only that we need to make a distinction between technology that is used by teachers as part of their instruction and tech that is used by students as part of their learning. They are not necessarily the same. Certainly not of equal value. 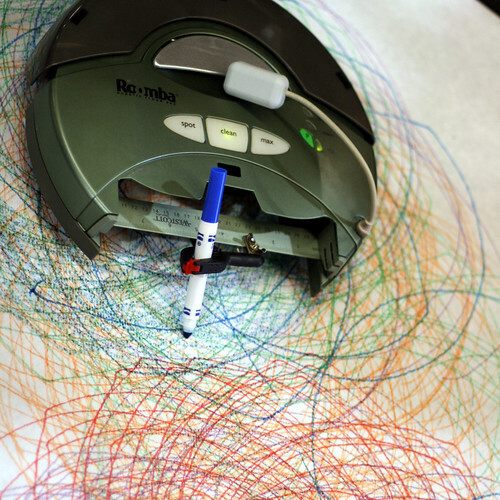 Image: Roomba hack: spirograph! by squidish on Flickr and used under a Creative Commons license.